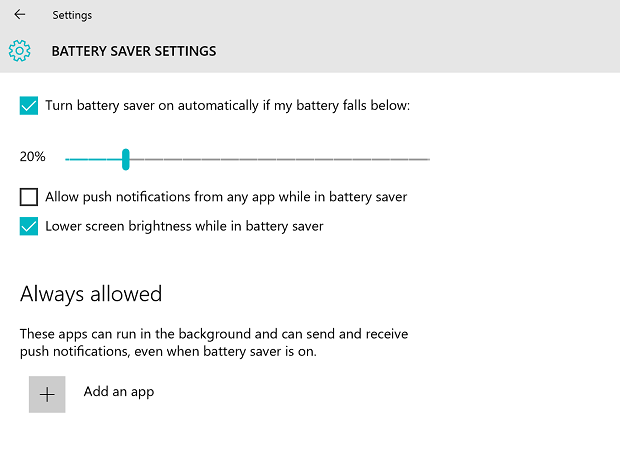 Beginning from Windows 10 Build 14332 for Windows Insiders, and Windows 10 Anniversary Update (Build 14393 Version 1607) for general public, in order to further optimize battery usage, improve battery life and prolong system usage while not connected to charger, Microsoft incorporates the same underlying technology used by Battery Saver to block some of the less-valuable apps, services and activities that occur during Connected Standby while still keeping your PC connected to the Internet and allowing key connectivity scenarios to work. In other words, after upgrading to Windows 10 Anniversary Update or Windows 10 Build 14332 or later, you may face with issues where Connected Standby does not work as intended, or what’s previously work now do not, as Windows is suppressing the background activities of the apps more aggressively. For example, you may not receive new notifications from Windows or some apps, emails are not synced and etc. Go into Settings -> System -> Battery. Add the apps that you want to run during Connected Standby to Always allowed to enable them to continuously run in the background. To re-enable the new Connected Standby behavior, run the same command lines as above but just change ‘0’ to ‘1’.